The scope of what we help our clients achieve at Purple Co is quite extraordinary. We love seeing how people’s lives change when they are reconnected to purpose. We invite you to share the journeys experienced by our clients with us. Peter had experienced a significant episode of anxiety and depression. Every time he thought about work, he would become paralysed. When I first met Peter in 2011, he was terrified of walking into his workplace and even of his phone, in case someone was trying to call or email him about work. Peter was 45 years old and had been employed in a highly technical and professional capacity. He is university educated and well respected amongst his peers. Over the preceding 12 months, Peter had noticed a growing sense of unease and directly attributed this to his work. He had also noticed an overall decline in his mental health. Changes in the workplace resulted in erosion of his self-confidence, leaving him with feelings of failure and an overall sense that he was not good enough. Despite these thoughts and feelings, Peter would continue to work long hours, obsessively checking his phone and continuing to take on board problems that were outside of his delegation. Purple Co worked with Peter for 4 months after which he was able to enter his workplace, and successfully upgrade to full time employment in his pre-injury professional position. What did Purple Co do? Developed and implemented a staged introduction to the workplace dealing with elevated anxiety levels and anxiety behaviours as they presented. Engaged the support of Peter’s management team who kept him accountable to set boundaries for tasks and role responsibilities (as opposed to Peter trying to do everything on his own). Engaged Peter’s management team in discussion of the functional expectations of depression and developed a Peter-centred support process. Provided education regarding the functional expectations of anxiety and depression. Mapped energy levels and created a plan for energy management. Completed the E-DISC Personal Analysis which assisted Peter to understand that he hadn’t changed – rather that the demands of his role had changed and that the person/job fit was no longer as suitable. The E-DISC assessment is an incredible tool for helping people develop insight into their strengths and how to manage their health and productivity in the workplace. Peter expressed his surprise with how quickly he was able to move from being terrified of attending the workplace and requiring assistance with walking through the front door, to taking on new clients and customers on behalf of his employer. Peter’s lightbulb moment came when in completing the E-DISC personal analysis he was able to see that he had not failed, rather the personality traits that made him an excellent technician and an excellent problem solver meant that recent changes to his role responsibilities had made some aspects much more difficult for him. Peter is not symptom free. He does however understand how to function effectively even on “down days”. He is now empowered to have a discussion with his employer regarding his own person/job fit, and is anticipating that he will explore career development potential now that he has a greater understanding of himself. David – Don’t Tell Me I Can’t! David has a passion for work. He passionately wanted to be at work, to have a job, and make a contribution. After nearly losing his life in 2010 in a severe car accident and sustaining a traumatic brain injury, David’s tenacity and determination to get back to work is nothing short of inspirational. It has been an honour to work alongside David, his family and his rehabilitation team to assist David not only return to work following a motor vehicle accident, but also to remain in his job and thrive. His family will often speak of the enormous benefit that being at work has had for David across his whole life. David left a remarkable impression on me when we first met. He very clearly stated that it was his goal to get a new job (and to obtain his drivers license). Nothing else mattered – getting back to work was David’s goal. This did not appear easy in the beginning, but David made it so much easier. His enthusiasm and continued commitment to this goal saw him placed within 4 weeks of our initial meeting. This placement resulted in paid employment. Commencing at 12 hours per week, David is now working 20, and we have plans to help him increase this to 30 hours per week. David showed us drive, determination, and enthusiasm. His family showed us what nurturing, a safe place to belong and a desire to simply make it work can do. 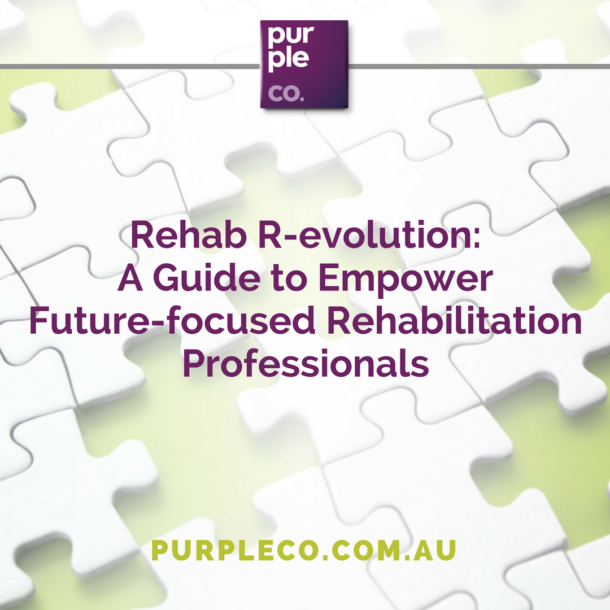 As Rehabilitation Professionals it is so rewarding to be able to share the success of our clients. We know that work is good for our health and well-being and the positive impacts of working are well documented and supported by medical science. All the elements of sound, collaborative rehabilitation and case work have been at play while working with David. The result speaks for itself. Congratulations David. Thanks for to David and his family for permitting us to share David’s story. Samantha – Just get on with it. While walking across the front yard of a friend’s home, Samantha was hit by a speeding, drunk driver – taking the full force of an out of control vehicle on her left hand side with multiple factures and crush injuries to the left upper arm, shoulder, wrist and a fracture to the left hip. The injuries were pinned and plated, resulting in pain, poor mobility and ruined ability to carry plates and perform table service. This was devastating for the owner/manager of a restaurant. Samantha is in her early 40’s. A successful restaurateur, she has worked in some of the most famous restaurants in Sydney. Samantha explained when we first met that her career in hospitality and restaurant management had been her passion and she had given “everything she had” to her current restaurant venture. When Purple Co met Samantha, she was even more uncertain about her future. The restaurant was unable to provide her wages while she did not work and the income protection payments were for a minimal amount of her pre-disability salary, and were for a 2 year fixed period only. Samantha wanted to focus on her injury recovery, however she was also feeling the pressure of significant financial strain. Without her restaurant or hospitality career, Samantha was really uncertain of her fit in the world. After 12 months she identified that a significant lack of purpose was contributing to a growing experience of depression. Instead of seeking more treatment and more diagnoses, Samantha decided to take back control of her health and work life. Despite a fracture to the left hip that didn’t want to heal and the need for further surgery to the upper arm, Samantha chose to complete her Cert IV in Training and Assessment. As a result, she has secured part-time teaching within TAFE. Samantha is by no means symptom free and continues to use a walking stick to assist with mobility. However she is now in control of her finances and is able to plan when to have surgery (in between semester breaks) so that she can maximise her earning capacity during this stage of her life. Samantha has been an inspiring client to work with. Her determination to just get on with it has caused me to consider how many clients could benefit from a similar attitude. Samantha’s goal is to re establish her restaurateur career, but she knows she will need to improve both her finances and her function to enable this to occur. Reconnected to purpose, Samantha is simply getting on with it.